Paper feed: The paper feed is where you store the paper that the printer eventually prints on. Manual/envelope feeder: Fancier printers may have a special slot, tray, or foldout-thing used to manually feed special papers or envelopes. It may be hidden on your printer, and it’s not shown in the preceding figure, so look around a bit to see whether your printer has such a deal. Ink/toner replacement: Printers don’t go on printing forever. At some point, you need to feed the thing more ink. Be sure that you know how to open the printer to find where the ink goes. Control panel: You use this panel to . . . well, control your printer. Memory card reader: Many photo printers have a place where you can directly plug in your digital camera’s memory card. 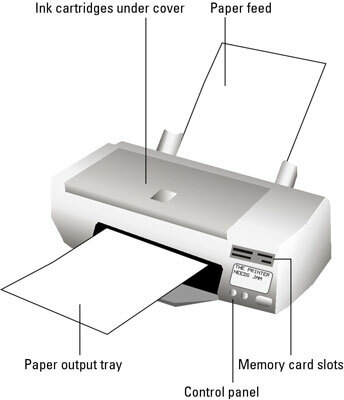 Paper output tray: The printed paper comes out and is stacked up in the output tray.